Why do microgrids become a hot topic when talking about natural disasters’ impacts and possible solutions? In an increasingly connected society, the economic impact of extreme weather and associated power outages has escalated rapidly. The National Oceanic and Atmospheric Administration estimates that 2017 was the costliest year on record, with 16 different disasters collectively costing the United States more than $300 billion. As government officials and policy stakeholders grapple with how to respond to this unprecedented economic and environmental impact, voices have emerged in support of a strategy that emphasizes proactive investments in resilience over reactionary response. In fact, the director of government affairs at the World Resources Institute, Christina DeConcini, recently told the New York Times that the federal government is not adapting to the risks posed by climate change; spending too many resources on rebuilding in regions affected by extreme weather, when instead, they should be building resilience against disasters proactively. 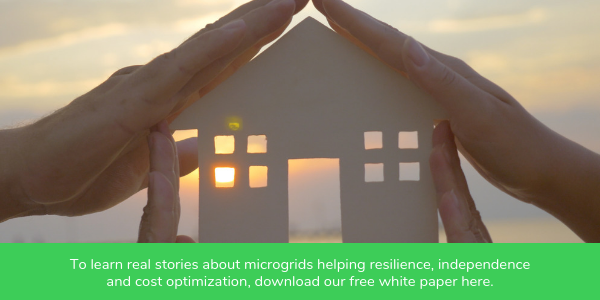 Microgrids have proven to be a viable option to strengthen the electrical grid and serve communities when disaster strikes. Rooted in IoT, microgrids can especially have impact on communities where infrastructure is lacking – or nonexistent – by allowing the creation of power grids with a customized energy infrastructure based on the community’s needs. And, for economies like the United States’ – where electrical infrastructure is in place but aging – new technologies connected by microgrids can transform legacy infrastructure into a resilient power grid that offers reliable access to energy, even when extreme weather hits. Furthermore, since most modern microgrids embrace renewable energy and improve flexibility, they provide value to both consumers and the grid between storms in the form of low-cost clean energy and load management. By establishing an energy system that is resilient, reliable, green, predictable, and digital, we remove the barriers from all our critical systems and enable our businesses and communities to reach their full potential. Microgrid adoption is a decision we can’t afford to pass on as we fortify our future for the new energy landscape. Historically, energy resilience has been achieved through efficiency, diversity, and redundancy. While effective, this approach can be highly intrusive and capital intensive. As a result of aging electrical infrastructure, new stresses from the global economy, and the advent of new technologies, the grid has become strained and unable to keep pace with the increased energy demands in today’s age. Through cloud-connected software platforms, analytics and decentralized control, we can perform minimally invasive upgrades to infrastructure to help power systems operate much more reflexively. “Smarts not Parts” is now driving resilience, and it is imperative that we fortify our energy infrastructure to prepare for future extreme weather events and power outages that place our well-being at risk. As visibility of how microgrids can supplement current power infrastructure increases, the conversation around how to implement microgrids – and pay for them – has naturally followed. Energy-as-a-Service (EaaS) is a business model that is disrupting the space, empowering consumers to embrace microgrids across North America. EaaS enables consumers and communities to solve for energy resilience, sustainability, and cost that is tailored to their unique objectives without requiring them to operate a utility or break their budget. For example, communities that need to significantly upgrade existing electrical infrastructure while configuring their system to integrate renewable, on-site distributed energy can now do so without the lingering concern of surpassing their energy or capital construction budget. This allows end-users to be more creative and strategic with the way that they manage their energy. Furthermore, EaaS allows consumers to transfer technical, regulatory, and operational risks to counterparts that are more prepared to mitigate them without giving up governance rights. The journey to better resilience in the face of the increasingly severe impact of climate change requires us to think differently about energy. Software, analytics, and the decentralized control of digitized equipment helps make the most of the physical infrastructure that we have in place, achieving resilience while minimizing redundancy. Innovative business models like EaaS unlock the ability to bring that technology to bear today – before we feel the impact of the next storm.